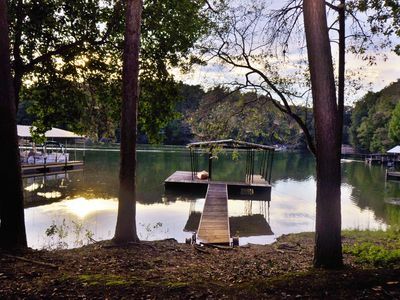 Relax in our Charleston-style waterfront home on beautiful Lake Hartwell. 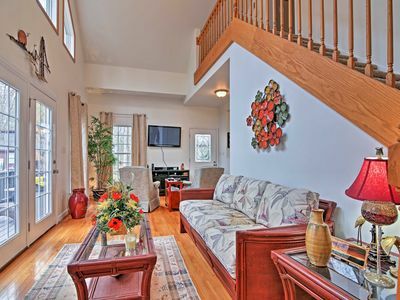 This quiet getaway is located on a quiet cul-de-sac hidden from the hustle and bustle of everyday and situated on an alcove tucked just off of big water. 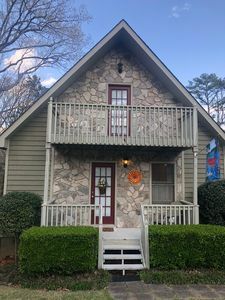 We have gone to great lengths to make this a comfy home away from home with all the ammenities you want in a vacation rental. This 2,700-sq.ft. 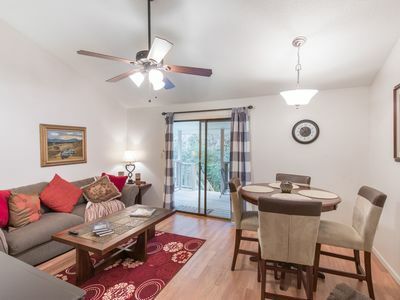 home has hardwood floors, plush leather furniture, stainless steel appliances, wireless internet, DIRECTV, dining room table, coffee table doubles as dining table for kids, a work nook with Dell printer, a playroom, swim towel/toy nook, and a fully-equipped laundry room. Third floor has 2 bedrooms with brand new luxury quality mattresses, a 320 sq. 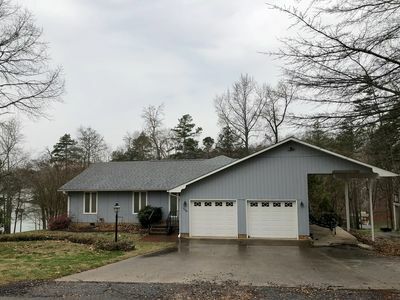 ft. master bath with jetted tub, stand-up shower, dual vanity, a separate water closet, and access to the top, front porch; and the work nook. 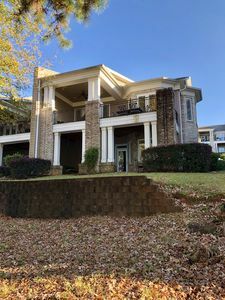 The main level serves as the public space with the kitchen, dining area, living room, pantry, half bathroom, playroom/kid’s room, screened porch and a deck. 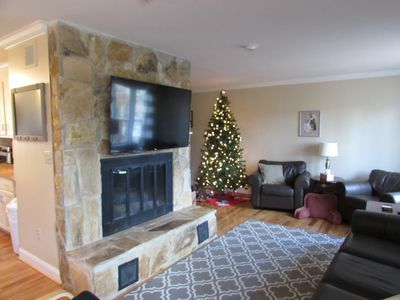 Additional highlights include a large screen HDTV with expanded DIRECTV, wireless internet, foldout twin sofabed, TV/DVD in playroom (plug-in ready for favorite game systems), board games & puzzles, fully-equipped kitchen, grill, hammock, and more. 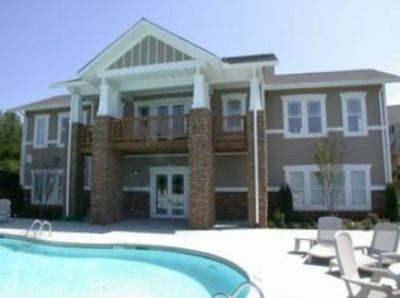 Ground floor has: 2 bedrooms, a full bathroom with tub/shower combo and dual vanity, and a swim towel/toy nook. Additional sleeping options: a twin fold-out sofa bed (in playroom), an Aero-bed, 2 fold-out extra long twin beds, and a pack-n-play. 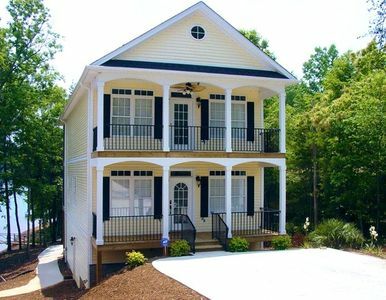 The front of the house has 2 long porches. 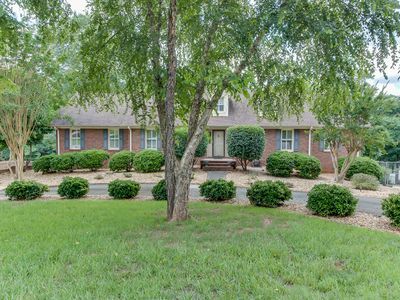 The back side of the house has 2 decks, 2 screened porches, & a large patio that offers a variety of space for outdoor activites. The 3rd level has a furniture set for 2 and a hammock to enjoy the peace and quiet atop the trees. 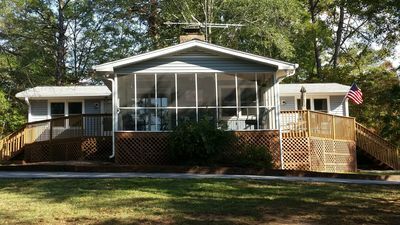 The main level screened porch has a table that seats 6, a chargriller charcoal grill, and child-sized adirondack chairs. The 1st level has adult-sized adirondack chairs to sit and enjoy the up-close view of the lake. 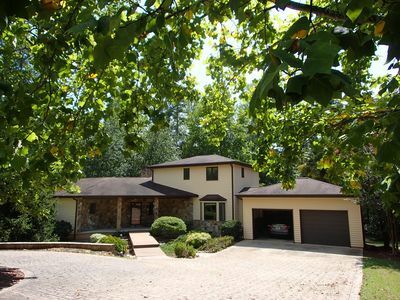 We are on a gentle-sloped lot that is within 65-feet from house to the waterfront along a shaded concrete path. No long uphill/downhill hikes! 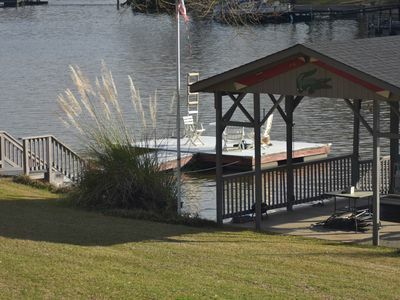 We have a covered deep water dock with electrical and water service. 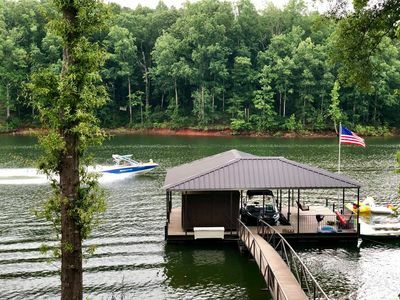 You’ll enjoy spending the entire day on the dock and swimming in the protected lake alcove – out of the wind, waves and boat traffic. Grab a floatchair and float your worries away! 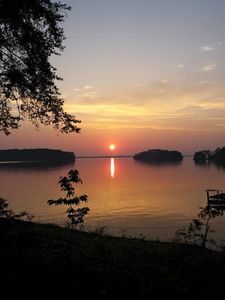 Like the name says, this is “Hartwell Heaven”! 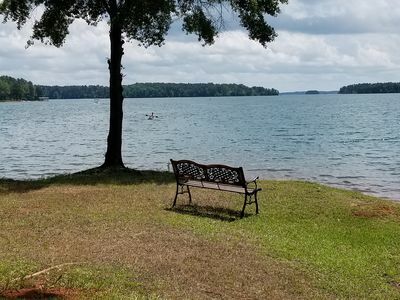 Hartwell Heaven is less than 90 minutes from the Atlanta metro area, only 45 minutes from downtown Greenville (SC), and just over 2 hours to Charlotte making this an easy weekend or full-week getaway. 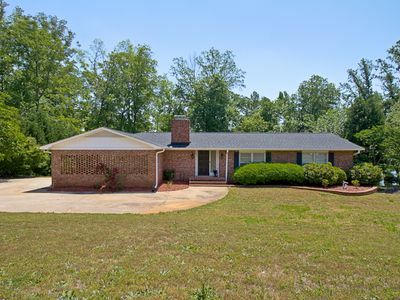 Conveniently located less than 15 minutes from Anderson (SC), you can find all the restaurants, shopping and entertainment needs of a larger city. 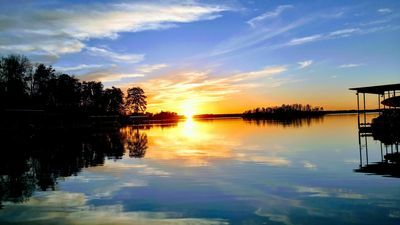 For Clemson University alumni and fans, we are located only 20-25 minutes from the campus by car, or you can take your boat for a pleasurable cruise up the Seneca River and dock nearby “Death Valley”. 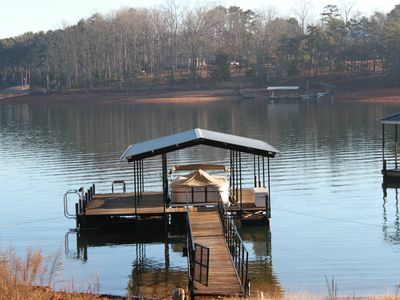 4 BR, Close to Clemson, Private Dock, Pontoon Rental, Tennis & Baksetball Ct.
A Perfect Waterfront Villa on Lake Hartwell. Come relax, have fun, get away! 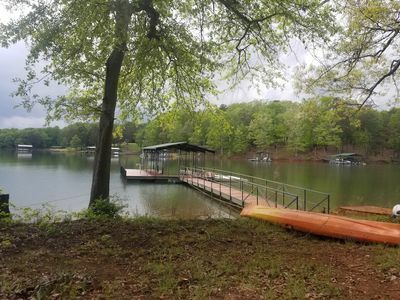 Beautiful Executive waterfront Rental on Lake Hartwell. With Dock! 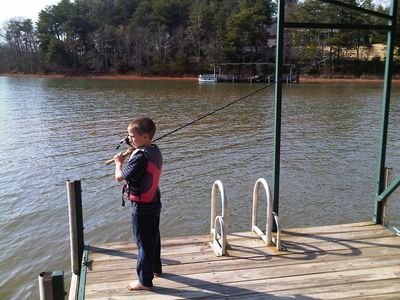 Southern Comfort on Lake Secession - Come to the lake the waters great!